Yesterday I had an early morning meeting away from my computer. 1:50. 'Morning Wolf. You mean Sudoku.com.au isn't the first thing you reach for in the morning? Oh, it is, tom but I had to leave it before the new day to get to my meeting. Good Maen, gentlemen. Good Maen, good people. Going up you'll leave two 2s and two 6s hanging but they are easy enough at the end. 🙋🏼‍♀️Good MaeN ❄️🌲☁️ Catching up on my evening TV shows while doing a load of laundry- rain or snow coming- so should be a fun night at work! Rather have snow then that icy rain ! Well it seems I don’t know my day from night - up early today ! Dreary again. Must be warming up. Looking for warm and sunny together. Wow - can you imagine the feats involved in building this enormous church with all those towers and spires?! Hello all - a bit sunny with promises of a slight warming trend today - nice after single digits! Everybody!! Glad everything is ok with Wolf! We saw the church when we were in Prague. In the Old Town Square, you can also see the amazing astronomical clock. It's a beautiful city. We were on a river cruise and were to dock near the parliament building. We had to dock elsewhere and be bussed into Prague because there was a planned demonstration in front of the parliament. Their demonstrations are much more civilized than ours. Teachers strike still going on. Now it's not about the pay, it's about the students - small class size, more nurse and psychologist time, and no funding for charter schools that don't follow the same rigorous standards and accountabilities as the public schools. Cat update. They are making us laugh. We have over a foot of snow on the ground moving in to this week's brief warm up. Marlowe's fur is growing back in splotches so she's still in no shape to go outside in the bitter temps. This means she is going stir crazy. Putting the Nut in Nutmeg. We're getting close, Keith. Hurry up or I shall take a page from Pip's playbook and jump over you from above! Guess not. So, I'll pounce. First time here today, and I'm just too late. Morning all,beautiful building that has stood the test of time. 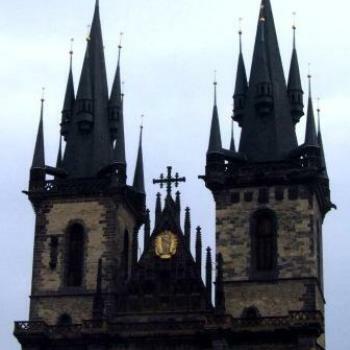 Eileen for the lovely photo of the towers in Prague. All the rooms in my house are called Here After Rooms... I walk into them and think What am I here after. Oh, Rage - I truly love that one! I think I read somewhere that walking through a doorway has some major influence upon brain cells - but the easiest thing is to not move around much, one's memory works better in repose! Big event coming up this week! Thanks, Rage. I enjoyed that. Hurricanes play the Sixers tonight. I'll have a few more then. mAen everyone... a few after work puzzles before I go for a pushbike ride. My sons house is still standing but conditions are fluid....Keep hoping! 2:11 Very slow this evening.